In 2017, wind turbines accounted for more than 6% of the nation's electricity supply—enough to offset the consumption of 24 million homes. But while wind is an up-and-coming energy powerhouse, its variable nature leaves wind farm operators uncertain about whether they will be able to deliver promised power, or if they might produce more power than the grid can accept. That question can lead to lost revenue. To improve wind forecast accuracy, DOE's Wind Energy Technologies Office funded the second Wind Forecast Improvement Project (WFIP2). Building on the first Wind Forecast Improvement Project, which examined the impact of improved initial conditions in advanced forecast models in areas with flat terrain, this combined modeling and field study was designed to improve forecasts in areas of complex terrain, where wind circulation and flow make predictability especially challenging. Focused on studying the effect of different variables in forecasting wind speed and turbulence at turbine heights averaging more than 262 feet and rotor diameters of more than 300 feet. Generated one of the most comprehensive data sets collected to date in complex terrain—not just for density in observation, but for its 18-month duration—comprising the full spectrum of atmospheric conditions. The team observed strong winds near the Earth's surface that eroded cold pools—regions of relatively cold, calm air that form particularly in the winter. This erosion in turn causes wind conditions to change significantly, sometimes in a matter of minutes, resulting in surges of power from the wind turbines that make accurate forecasting difficult. The team developed and implemented a new algorithm in their study that improved the timing accuracy for cold pool erosion. The algorithm has now been included in the National Oceanic and Atmospheric Administration (NOAA)—a key research participant in this project—National Weather Service operational forecast models. Data gathered, which are available to other scientists and the public to benefit the wind industry, will help inform future research to support offshore wind development in the United States. The data will also help energy planners determine whether they should buy more wind or use other energy sources. The full study concluded in September 2018. A collaborative project, WFIP2 involved experts from Vaisala (the award Prime Recipient) and its team, including the University of Colorado, University of Notre Dame, Texas Tech University, Lockheed Martin Coherent Technologies Inc., and Sharply Focused LLC. 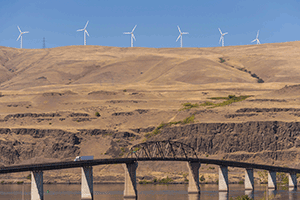 Additional data and support were provided by Iberdrola Renewables, Southern California Edison, Cowlitz County Public Utility District, Eurus Energy, and Portland General Electric. The project also involved NOAA and four of DOE's own national laboratories— Pacific Northwest National Laboratory, Argonne National Laboratory, Lawrence Livermore National Laboratory, and National Renewable Energy Laboratory.